Does anyone have the accident report for the crash Kip supposedly injured his knee in and may, "...never again run competitively...?" Add faked car crash to the list. Why would Kip bother to register for Boston 2012 if his running career is supposedly over? Dan Baxley has not posted since his profane tirade defending his friend, Mr. Litton in letsrun KL thread #1 (deleted). I am waiting for potty mouth Dan Baxley to post again defending Mr. Litton. He has been silent since his outburst back in the initial thread. Dan Baxley (friend of Kip Litton's) to (SOKLR): "I have known Kip for over 30 years, and no, I do not believe he is cheating. By direct proof I mean an eye witness seeing him do whatever it is exactly that he is accused of. Also, an article for a national magazine (>1million circulation in 2009) is in the works. Not circumstantial evidence such as not appearing in a photo, stripping his sweatsuit off as he grew warmer or changing his shoes. I know that he has run in hundreds of races; if he were cheating in all of them, surely someone would have seen him. For that matter, why don't any of you simply find him before the race and run with him if you are that concerned. Actually Dan, we tried doing this at Maine Marathon. But when Kip found out he was going to be followed, he immediately switched to the half marathon and ran a sub-par 1:28 half marathon. Kip is also incredibly difficult to spot at the starting line, Dan, because race photographers' photos have shown that he wears civilian clothing when he crosses the starting line and running clothes before the finish. Again, We'd love an explanation, but we've never heard from Kip. I also know for a fact that he is doing very well financially, and that his son is afflicted with CF. So the claims that his charity is a scam are scurilous lies. What does the fact that he's doing well financially have to do with it? His charity was raising money for Cystic Fibrosis Foundation. That's a very nice thing he's doing but he need not cheat to do it. 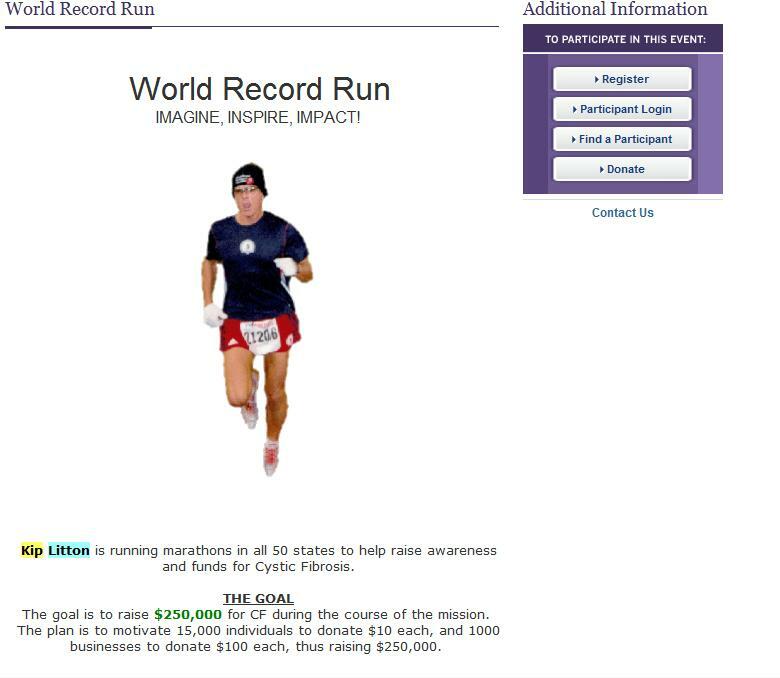 We understand that in the process of raising money for CF, Kip is trying to run marathons in all 50 states. Dan, Please see for a screenshot of his charitable efforts (thanks to Google cache). http://4.bp.blogspot.com/_ik6d...kip123.jpg Because he's not actually running these marathons, he's misleading donors into thinking they're donating to a 50 state marathoner, when in reality, they're not. Kip has fabricated races such as the West Wyoming Marathon. It appears from the race description of West Wyoming (hosted by the same IP as Kip's dental business) that Kip needed to cross Wyoming off his 50 state list. So he made up the race. And It's a race he won, but the results have been confirmed false by marathonguide.com. No one we spoke to in Wyoming has heard of this race. 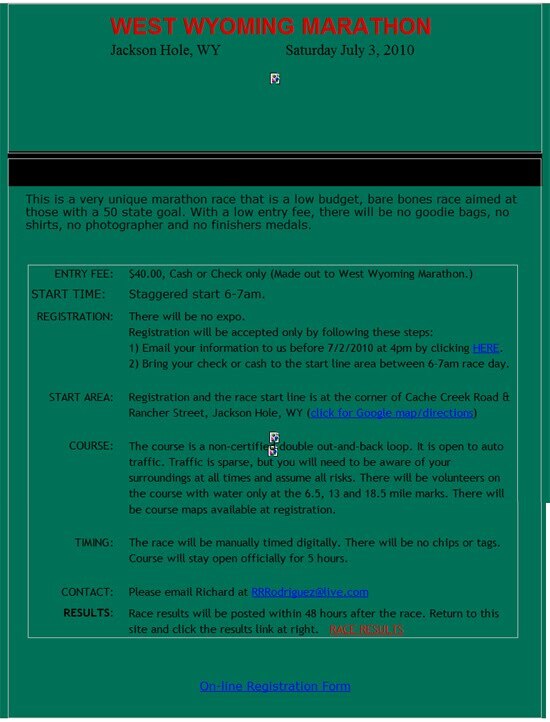 Dan, Please see a screenshot of WestWyomingMarathon race description (yes, for some unknown reason, the website has been taken down - perhaps Kip had it taken down). Dan Baxley (friend of Kip Litton's) to (SOKLR): Also, I wouldn't bank on him running Boston in '12 - he was in a car accident which lead to knee surgery, and he may never run competitively again. OK. Did his surgery go well? We hope so. Why is he registered for Boston 2012 if the only marathon we know of that Kip completed within the Boston qualifying window was the Charlotte Marathon, where eyewitnesses spotted him cheating? (previously mentioned above). Dan Baxley (friend of Kip Litton's) to (SOKLR): Now let me ask you some questions: Kip has been accused by you people of being sociopathic; but what kind of person takes the time to create facebook pages and websites dedicated to publicly smearing someone's name? And if you are going to publicly defame someone, why don't any of you at least have the integrity to do so under your own name?" Many of us have given our real names. It's not a mystery. Go talk to the race directors who've supplied me with the information (e.g. Montana, Delaware, deadwoodSouthDakota, etc.). The eyewitnesses at Charlotte have given their names. The website is not a smear. Litton could sue us and win if we were doing this, but not if what we're posting is true. The best defense for libel is truth. We'd love to talk to him. We've tried to give an objective of an account as possible on the blog. The race photographers' photos, splits, and history tell a story, and Mr. Litton has some serious explaining to do. We'd love to hear from him. From his silence one can only conclude that he agrees with what is being said. Oh Dear God in Heaven above, please go away. If there is really a Dan Baxley who knows Kip and believes that Kip actually ran the races in the times he has claimed, you are more out there than him, IF you actually exist. Dan (Kip?) , have you watched the videos? Have you seen the evidence? Have you seen him in the back of the pack over and over and somehow pass 1000's of runners and not be seen doing so, not once? Have you seen him walking across the finish line looking like a 4 hour marathoner, not 2:50? Have you seen him hugging the curb with no number exposed? Have you seen him with a hat and sunglasses for the majority of his races? If you really exist and aren't Kip, I honestly believe you need help. If my friend claimed the same things I would be smart enough to know he's not being honest. Go away Dan or KIp and enjoy your highly wanted reward, publicity. WOW The photo of him looking back and waiting for the moment to take off as if he's running with someone says it all. The lady in red taking a photo is classic? He claims a 2:57? Give me a break, he takes off jogging and with 4 hour plus marathoners. He must be highly embarrassed as I assume his wife and friends are as I am sure they have all seen the photos and site. Mr. Dan Baxley shared all of that with me yesterday through facebook. I'm assuming he is close to Kip's situation about the car accident and knee surgery. Hopefully Kip will be well enough to race again once he comes clean. He must be highly embarrassed as I assume his wife and friends are as I am sure they have all seen the photos and site. You'd be surprised as there are a lot of non-runners (Dan Baxley and others?) and a few super-novice runners who just don't understand running very well. They don't understand even the most simple instances of we're talking about here: BAA 2010 5k - to wait over 4minutes to cross the starting line, to start in "dead balls" last behind 3500 people, and to go 5:34min/mi and come in 40th overall. At the very least, Kip took a wrong turn, came across in 17:17 and it was an honest mistake. Too many honest mistakes week in and week out though. OR to walk during a 17:33 5K at Gasparilla 2010 with a 3:07 chip/gun differential and the photos suggesting Kip walked across the line in civilian clothing (Snickers logo on a black sweatsuit). They must give Kip the benefit of the doubt and think "well maybe the race photographers made a mistake" OR that "our good ole friend Kip must've walked to tie his shoe and sped up to 5:00min/mi in a black sweatsuit." One thing that's going to be really interesting is to see how the author of the upcoming article explains this to the masses. It's not an easy thing to do with non-runners. People look at the Study of Kip Litton blog and think "OK, so Kip starts 3-4 minutes after everyone else. I guess he likes to start at the back. He doesn't like the pressure. So how is that cheating?" You've done a great job with the site and information on it, but....any logically thinking person, whether they know him or not, is not going to believe his story after looking at how it has been proven. I totally understand the point you've raised, but mathematically it is nothing but impossible to run the times that he has with the photos of him at certain race points. Yes, there is always a small percentage that won't get anything, but the majority who look at the videos and photos and people who never saw him in front of them until the later stages is beyond reasonable doubt. To start that far back and then continuously pass runners at an extremely fast pace would stand out more than someone sliding in during the later stages of a race. Why didn't it, because it didn't happen that way. Again, stand away from others on the course and blend in like you are running with someone who just went by or just run on the shoulder and work your way over. Honestly, it's not genius, just dishonest and someone looking for publicity/attention. And if he started that far back he wouldn't begin by jogging and losing more time, but just the opposite. Those who have seen your site and are even the least bit skeptical that he might be for real need to get examined and to do so quickly. Trust me, even non-runners seeing the proof won't have too much of a problem figuring it out. Am I the only one that finds it ironic that Kip was in an accident and now probably cannot run for the rest of his life? Do we have any proof of an accident? i think the news of the accident came shortly before CowTown Marathon in Fort Worth, TX. If injured, I hope he's OK. It did come out right before, and when you call Cowtown Marathon, they know Kip very well. All you have to do is say his name on the phone and you get a story. Same goes for any race he has run... even the ones that didn't DQ him. I have previously corresponded with the race director of Zoom Yah Yah and I sent him an email tonight asking whether Litton is in fact registered for the 2012 race and also a link to the Study of Kip Litton web site. I received a reply today from the Zoom Yah Yah race director. He is aware of the accusations against Litton. At the present time, Kip Litton is on the wait list (at position #20) for the January 8, 2012 indoor marathon race. Naturally we don't know how authentic it was but maybe 15 pages back someone claimed to have been on a track with Kip recently and he was doing reasonably fast intervals. How do you cut an indoor marathon? That's a David Copperfield trick. ...If this is the one I wouldn't believe a word he says. Someone mentioned them using counters to count a runners laps. And a co-conspirator counting "optimistically"